Base class that all NDN applications should be derived from. Size of this type is 288 bytes (on a 64-bit architecture). Definition at line 48 of file ndn-app.hpp. Definition at line 84 of file ndn-app.hpp. Definition at line 85 of file ndn-app.hpp. Definition at line 86 of file ndn-app.hpp. Definition at line 70 of file ndn-app.cpp. Definition at line 77 of file ndn-app.cpp. Definition at line 37 of file ndn-app.cpp. References m_receivedDatas, m_receivedInterests, m_receivedNacks, m_transmittedDatas, m_transmittedInterests, and m_transmittedNacks. Definition at line 108 of file ndn-app.cpp. Method that will be called every time new Interest arrives. Definition at line 114 of file ndn-app.cpp. Reimplemented in ns3::ndn::Consumer, ns3::ndn::ConsumerPcon, and ns3::ndn::ConsumerWindow. Definition at line 121 of file ndn-app.cpp. Definition at line 128 of file ndn-app.cpp. Definition at line 82 of file ndn-app.cpp. Definition at line 97 of file ndn-app.cpp. Reimplemented in ns3::ndn::Consumer, and ns3::ndn::Producer. Definition at line 138 of file ndn-app.cpp. References ndn::nfd::FACE_SCOPE_LOCAL, m_active, m_appLink, and m_face. Referenced by ns3::ndn::Producer::StartApplication(), and ns3::ndn::Consumer::StartApplication(). Definition at line 162 of file ndn-app.cpp. Referenced by ns3::ndn::Producer::StopApplication(), and ns3::ndn::Consumer::StopApplication(). Definition at line 103 of file ndn-app.hpp. 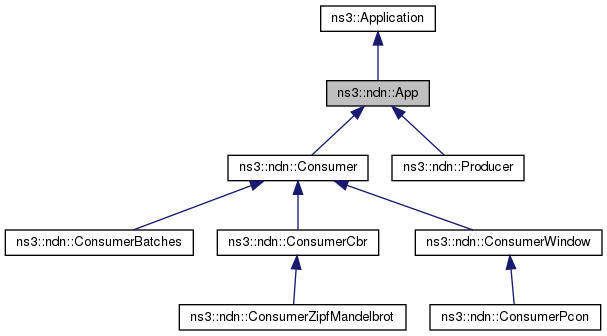 Referenced by ns3::ndn::Consumer::OnData(), ns3::ndn::Producer::OnInterest(), ns3::ndn::ConsumerZipfMandelbrot::SendPacket(), ns3::ndn::Consumer::SendPacket(), StartApplication(), and StopApplication(). Definition at line 104 of file ndn-app.hpp. Referenced by OnData(), ns3::ndn::Producer::OnInterest(), OnInterest(), OnNack(), ns3::ndn::ConsumerZipfMandelbrot::SendPacket(), ns3::ndn::Consumer::SendPacket(), ns3::ndn::Producer::StartApplication(), StartApplication(), and StopApplication(). Definition at line 105 of file ndn-app.hpp. Referenced by ns3::ndn::Producer::OnInterest(), ns3::ndn::ConsumerZipfMandelbrot::SendPacket(), ns3::ndn::Consumer::SendPacket(), and StartApplication(). Definition at line 107 of file ndn-app.hpp. Referenced by DoInitialize(), and GetId(). App-level trace of received Interests. Definition at line 110 of file ndn-app.hpp. Referenced by GetTypeId(), and OnInterest(). App-level trace of received Data. Definition at line 113 of file ndn-app.hpp. Referenced by GetTypeId(), and OnData(). App-level trace of received Nacks. Definition at line 116 of file ndn-app.hpp. Referenced by GetTypeId(), and OnNack(). App-level trace of transmitted Interests. Definition at line 119 of file ndn-app.hpp. Referenced by GetTypeId(), ns3::ndn::ConsumerZipfMandelbrot::SendPacket(), and ns3::ndn::Consumer::SendPacket(). App-level trace of transmitted Data. Definition at line 122 of file ndn-app.hpp. Referenced by GetTypeId(), and ns3::ndn::Producer::OnInterest(). App-level trace of transmitted Nacks. Definition at line 125 of file ndn-app.hpp.